He also held on to the number one spot on the Album Chart to make it a double for the Take That star. The Official Charts Company said the official Diamond Jubilee song, co-written with Andrew Lloyd Webber, made 142,000 sales since last weekend's Jubilee concert, to become the biggest selling number one of the year so far. Barlow masterminded the show in front of Buckingham Palace and was joined on stage by many of the artists who recorded the track, including the Military Wives choir and the African Children's Choir with their soloist Lydia. The single - which was 11th last week - also features Prince Harry bashing a tambourine, making him the first British royal to perform on a number one single. In second spot was Whistle by Flo Rida, a new entry, and in third place was last week's runner-up We Are Young by Fun, featuring Janelle Monae. Last Sunday's number one Feel The Love by Rudimental, featuring John Newman, dropped to fourth, while Usher's Scream was a new entry at number five. Singer songwriter Ed Sheeran's award-winning + flew back up the Album Chart from 13 to two this week, and fashion icon Paloma Faith's Fall To Grace slipped from second to third. The highest new entry was Paul Simon's 1986 record Graceland in at number 10, pipping The Best Of Kylie Minogue into 11th. 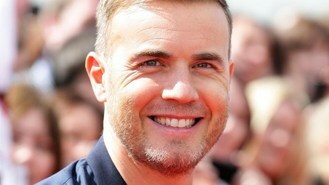 Barlow said: "It's been such a great week, it would take something very special to top it. I'd like to say thanks on behalf of about 200 people, as we've got a massive cast on this record. I love collaborating with other artists and being able to put them all on one stage, the other night was such an honour for me. It's something I'll never forget."